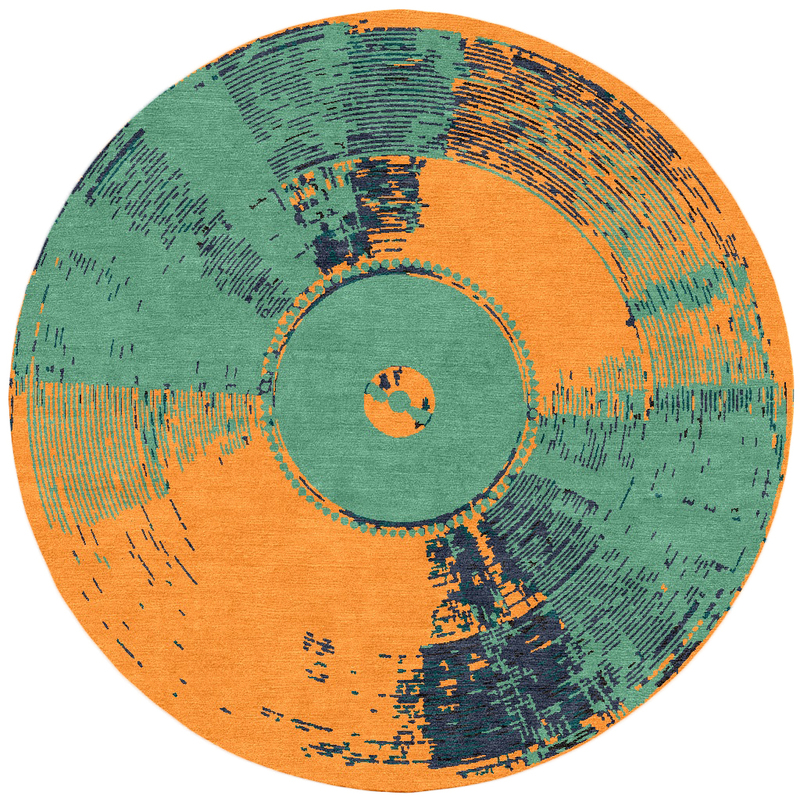 ‘Vinyl’ by Kush Rugs shown via visualization in colourway ‘Vibes.’ | Image courtesy of Kush Rugs. 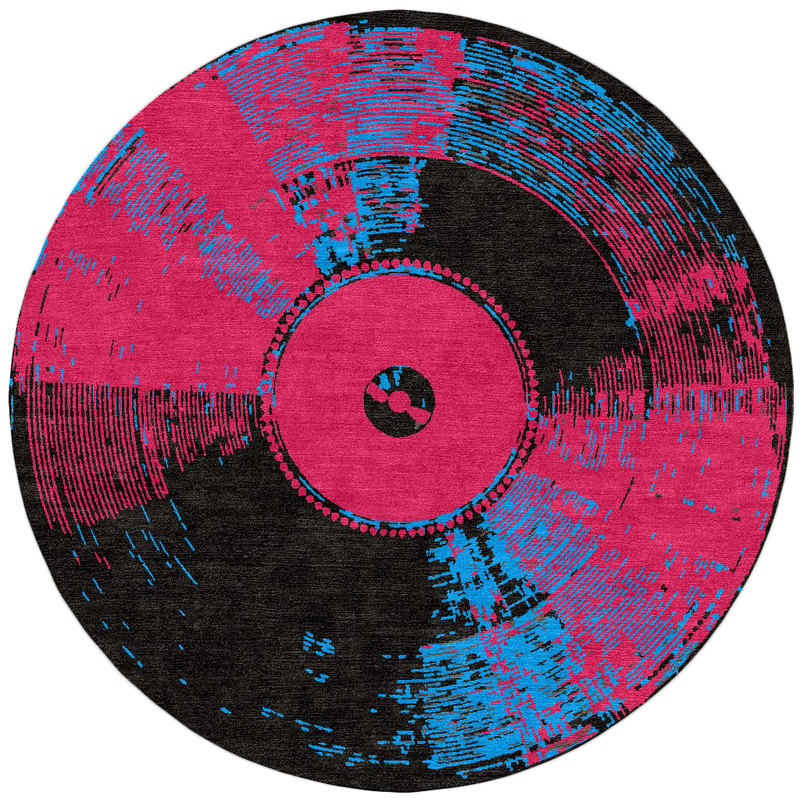 ‘Vinyl’ by Kush Rugs shown via visualization in colourway ‘Cotton Candy.’ | Image courtesy of Kush Rugs. ‘As technology, culture, and life itself rocket ever forward, I find myself drawn to touchstones that remind me of the seventies (1970s) and eighties (1980s).’ begins Brian as he is explaining the origins of ‘Vinyl’ via email. ‘In my misspent youth I sang in various basement bands, and as an adult I have morphed into a notorious karaoke junkie. I love creating rug designs that are rooted in a personal connection. Plus, it’s been great fun seeing the colour combinations that our clients dream up. We do enjoy a wild rug here in Portland!’ he concludes as the images he sent begin to fill the screen. Simultaneously nostalgic and modern, the vibrant colourations of ‘Vinyl’ the rug, transform what was an ordinary everyday, yet now somewhat archaic, black plastic disk into a functional and decorative objet d’art best described as ‘Warholian’. It is an easy parallel to draw. Warhol was known for his artistic treatment of the familiar, the mundane, and the mass produced and so in creating a rug inspired by the ordinaire Brian has channelled, no transported that zeitgeist from another era into our present time. Just as Warhol was a ‘pragmatic artist’ who ‘accepted the inherent commercial nature of the modern art world’ according to the Nazmiyal Collection, so too is this design a piece of functional art indicative of the nature of our modern rug era. 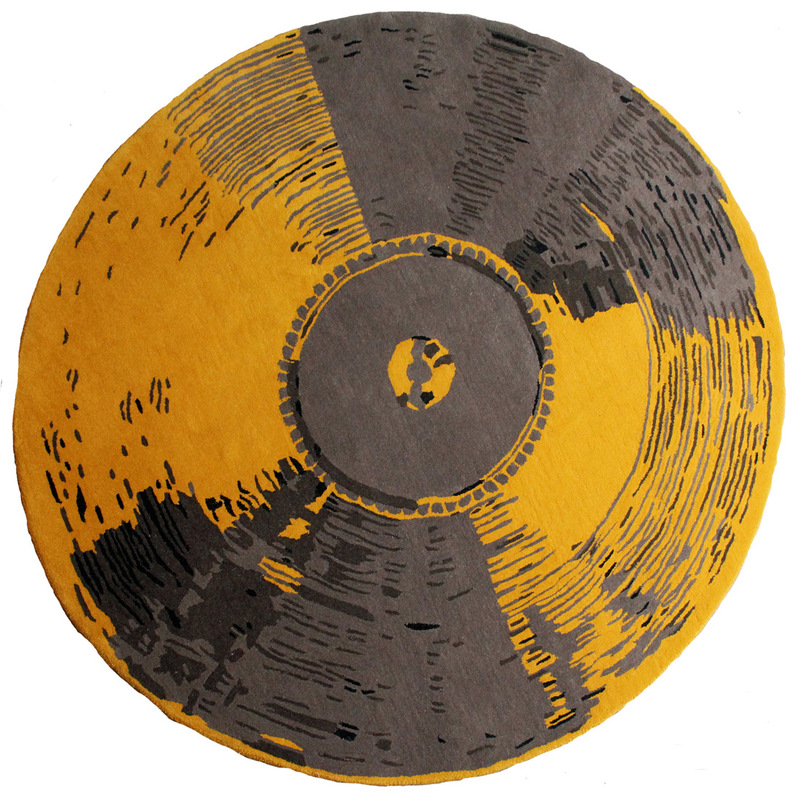 ‘Vinyl’ by Kush Rugs shown via visualization in colourway ‘Jives.’ | Image courtesy of Kush Rugs. 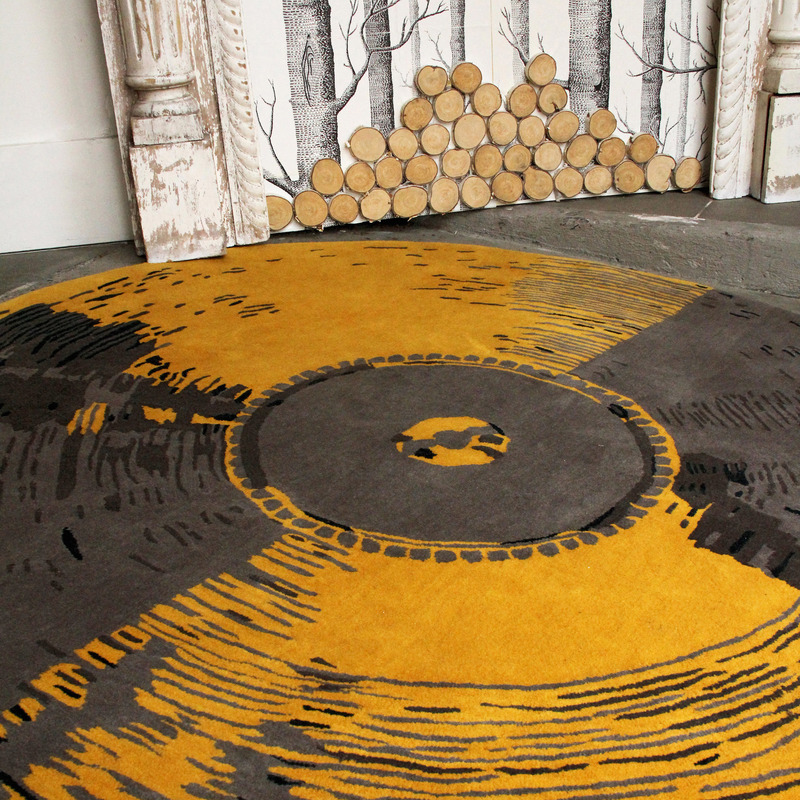 ‘Vinyl’ by Kush Rugs shown in colourway ‘Canary.’ | Photograph courtesy of Kush Rugs. ‘The ones and zeroes of digital formats have, of course, made music more convenient and accessible…’ Brian says as he expounds, but the proverbial lightbulb is lit. The overt parallel that can be drawn between music being more accessible and rug and carpet design being more accessible is simply too enticing to pass up. In the not as distant as we might like to imagine past, the notion that a single solitary rug dealer could create one-of-a-kind program rugs for his or her specific market was quite ‘disruptive’ as the corporate speak of today would have us say. Never before have the barriers to entry been lower and technology, love it or hate it, has brought us here. 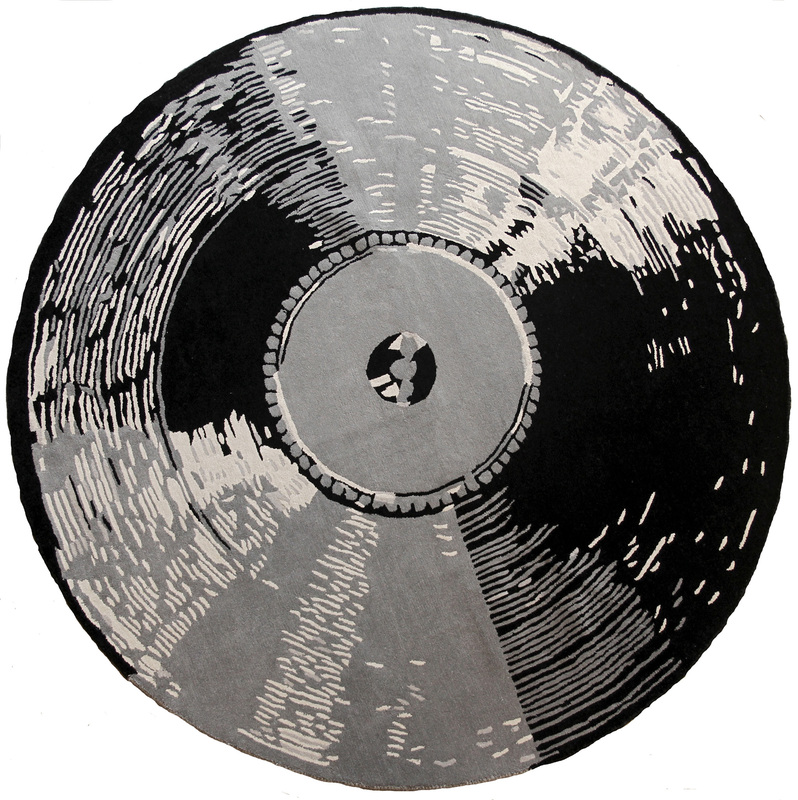 That is what makes ‘Vinyl’ (both as an LP and as a rug) such an alluring design. ‘Vinyl’ by Kush Rugs shown in colourway ‘Classic.’ | Photograph courtesy of Kush Rugs. ‘Vinyl’ perfectly embodies that longing, that halcyon gezellig (as the Dutch might say) feeling one has for times and places not fully our own, while at the same time remaining fully a construct of contemporary rug design and construction. ‘I spent many an hour in my family’s basement fiddling with my dad’s record player and listening to records.’ Brian further explains, ‘As a kid there was something magical about playing records.’ Just as most of the music industry has moved passed vinyl, so too has much of the (qualifying adjective of your choosing) rug industry moved past its old ways. Lamenting the mass passing, then niche resurgence of vinyl as a medium is overtly analogous to the feelings one might have of the decline of the hand in handmade, and of course what might be the ‘magical’ dream of its niche resurgence. ‘Vinyl’ by Kush Rugs shown in situ theatricalis in colourway ‘Canary’ | Photograph courtesy of Kush Rugs. Perhaps it’s best to quote Alanis Morissette when discussing the broader questions ‘Vinyl’ brings to mind. ‘Isn’t it ironic…’ that a rug design inspired by a near obsolete technology would be resurrected by a technological progression that is arguably rendering portions of the rug world – if not obsolete – far less relevant. The advent of ‘digital formats’ proved to be quite disruptive to the music industry, so is it now also the case that ‘digital formats’ will usher in a similar seminal period in the rug industry? Will exceptional designs such as this, that emerge from and are made expressly for more localized and specialized sources, supplant those peddled by the traditional wholesale distribution model? I know not for certain, but Kush isn’t the only showroom designing great carpets. ‘Vinyl’ is available from Kush in standard and custom colours in any size 5′ (1.5m) round and larger, and may be specified either in a handtufted quality from Indian or in a 100 knot handknotted quality from Nepal. Tufted rugs start at $1,000.00 (USD) for the 5′ round, whereas the handknotted start at $2,700.00 (USD). Pricing as of 16 November 2015, subject to change without correction herein. Next Post:No Euphemisms, It’s a Knockoff!